Stephen James HOWE was born on April 8th, 1947 in Holloway, North London. During his childhood he was troubled by ‘Fellini-like horror fantasies and nightmares’ for some years. He only could get asleep when he listened to music (like "Teensville” from CHET ATKINS). So music became an essential safety valve, if not an obsession pretty early on. When he was 12 years old, Steve got an acoustic guitar from his parents. A few years later he bought his first electric guitar (a Japanese Guyatone) and started to copy solos from the Fifties and Sixties rock-scene note-by-note (from Les Paul, Frank Beecher, Scotty Moore, Link Wray and Chuck Berry to Wes Montgomery, Django Rheinhardt and Barney Kessel). He was also influenced by Jazz icon Miles Davis, the classical composers VIVALDI and STRAVINSKY, classical guitar player Julian Bream and organ player Jimmy Smith. Steve incorporated all these influences and developed his unique style. He soon turned from a ‘bedroom-guitarist’ into a semi-professional player and became a ‘hot session-musician’. Steve joined his first band THE SYNDICATS (’63-’65), followed by THE IN CROWD (’66-’68) and received a "cult-hero-status’ in TOMORROW (1968), a kind of psychedelic update from the previous THE IN CROWD. Steve even played one gig in THE NICE when he replaced David O’List and he also did auditions for JETHRO TULL and BLACK SABBATH. But this didn’t work out for him and he joined BODAST (’68-’69). In ’71 he made his legendary move to YES after a phone call by Chris SQUIRE. Steve HOWE’s solo career started in ’75 with his first solo album entitled "Beginnings”. He also collaborate on albums with an impressive list of known musicians like Lou REED, Rick WAKEMAN, FRANKIE GOES TO HOLLYWOOD, PROPAGANDA, Stanley CLARKE, QUEEN, FISH and even the BEE GEES! Between ’81 and ‘95 Steve HOWE joined the commercially successful ASIA (’81-’83 and ’91-‘93) and GTR (’84-’87), he founded ABWH (YES minus Chris SQUIRE) and did a YES-reunion (’91-’92). Special projects/concerts: the album "Guitar Speak” from ’88 (with Andy Powell, Randy California and Robbie Krieger), the Magna Carta YES tribute "Tales From Yesterday” (with Annie Haslam) and the Montreux Jazz Festival in ’79. From ’95 he’s again a member of YES and recently did a world tour, more than 30 years after he joined this legendary ‘symphonic rock dinosaur’! His first solo album "Beginnings” from ’75 is a fine effort, showing HOWE’s varied style and his amazing collections of all kind of guitars (from Gibson and Fender electric to the banjo, Portuguese guitar and pedal steel guitar) but I don’t like his vocals. In my opinion his second record entitled "The Steve Howe album” is his best effort but my favourite is the live-album "Not necessarily acoustic” (from ’94). This one contains all his best material like the virtuosic "Meadow rag” and the fragile "Surface tension”. It also features songs from YES like "Excerpts from Tales from topographic oceans”, the Spanish climate from "Mood for a day”, the exciting "Clap” and the ‘stage favourite’ "Roundabout”. These compositions shows an amazing variety: Spanish, classical, rock, ragtime, romantic or jazz. 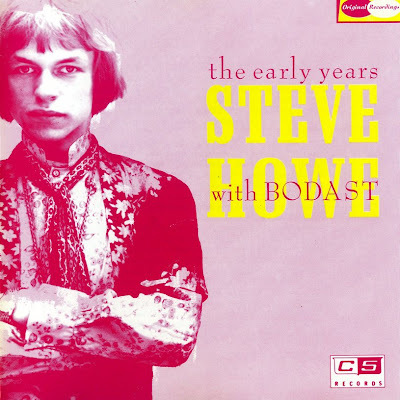 If you listen to Steve HOWE, you listen to a guitar-hero who scouted all kind of musical borders to become one of the most influential and acclaimed progrock guitarists of all time.